We recently were blessed to receive enough donations to purchase a vehicle for the mission work here. It is a new vehicle, at least that is what people here will tell you when they hear that it only has 100,000 kilometers on it. We were able to purchase it from another mission organization that has kept it in very good shape, I am sure just knowing we would be coming along later and need a vehicle. It has already been a blessing as Liz and I were able to go together yesterday and visit three different pastors, taking Christmas presents and playing Santa (on a side note, describing Santa to Tanzanians I realized that to them he sounds like a wizard “uchawi” which is not a good thing in their culture, something interesting to think about). So far though the most interesting time we have had with the vehicle was getting it home. It was at the mission headquarters in Dar es Salaam and that is where we had to go to pick it up. Dar es Salaam, if you have never taken Tanzanian geography as a class in school, is literally on the other side of a pretty big country. We are less than an hour from the western border and Dar is on the Indian Ocean on the other side. We flew there, but obviously had to drive back. The trip in total was almost 25 hours of driving time, 18 hours of which we did the first day. What amazed me though is how many speed bumps Tanzania has. I didn’t count, maybe I should have, but I can promise you that there are a lot of speed bumps. A LOT. If speed bumps where removed I would guess I could reduce the road trip by at least four hours (by my very scientific estimation). All of this is not really exciting for you to read about, but this trip did get me thinking, assisted by 25 hours in the car. That just as the road from Dar to Tarime is FULL of spend bumps so are our lives. Our lives are full of things that slow us down. And they are annoying too. They require us to shift gears, always in the downward direction. They require extra attention because you don’t want to hit a speed bump at high speeds (trust me ;)). However when I explained the annoyance of speed bumps to a friend after returning from Dar she explained why they were so important. She explained what it was like before the speed bumps, the drunk drivers at high speed and the large number of children and adults killed every year in traffic accidents. 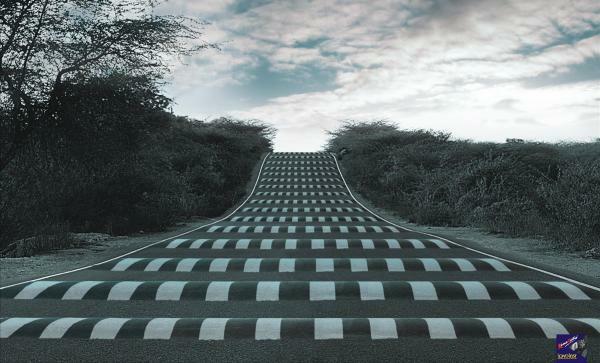 All of a sudden speed bumps became much less of an inconvenience. And this is often the case in life. The things that cause us to downshift, slow down, and pay more attention to how we are driving are not always bad, as frustrating as they can sometimes be. Life’s speed bumps help us to slow down and pay more attention to how we treat others and how we treat ourselves. The holiday season is a great time to do this. You have probably already done a million and one things to get ready for the “Christmas Season.” Our schedules have become ramped up and we have become more stressed all in an effort to…enjoy the holiday season??? Holidays can cause a lot of stress, but they can also be a good and necessary speed bump. They change the layout of the road of our lives and can help us remember to slow down, watch how we are driving, watch out for others along the road of life, and be more aware of what is going on around us instead of just cruising through as though nothing has changed. It is not too late, if you haven’t taken time yet this year. Carve out some time for family, friends, and true celebration. Allow this holiday season to be the speed bump that extends your time with family and friends and helps you truly pay attention to them instead of causing frustration at your lack of progress on life’s road. Blessings and Frustrations at Life’s Speed to All. For part two on holiday lessons from a road trip stay tuned.